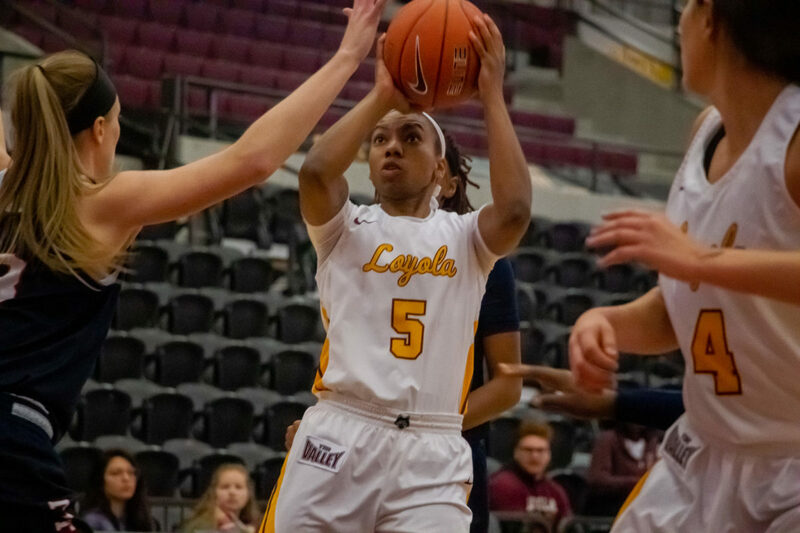 After losing to Youngstown State University Nov. 9 to start the season, the Loyola women’s basketball team (1-1) had a big comeback in the fourth quarter to win its home opener 52-43 over University of Detroit Mercy Monday night. The Ramblers struggled to gain control and didn’t have a lead until the fourth quarter. Their field goal percentage throughout the game fluctuated with their lowest being at 22.2 percent in the first quarter and their highest at 58.3 percent in the fourth to finish 35.4 percent for the game. First-year forward Allison Day led the team with 14 points and nine rebounds — one rebound away from recording a double-double. Junior guard Tiara Wallace shot three-for-seven from the field and three-for-four on free throws to finish with nine points. Sophomore forward Abby O’Connor also had nine points in only 27 minutes due to early foul trouble. Wallace was the source of six of the Ramblers’ 15 turnovers, which caused them to fall behind early in the game and allowed the Titans to pick up 11 steals. In the fourth quarter, Loyola gained some much need traction to widen its lead when Detroit Mercy guard Zoey Oatis was given a technical foul. After Rice sank both free throws, the Titan bench was given another technical, which sent Rice back to the line for two more shots. She sank both to put Loyola ahead 52-43, which held as the final score. Rice finished with eight points despite making just one shot in the first half. Next up, the Ramblers are scheduled to make the short trip to the West Loop to take on University of Illinois at Chicago. Tipoff is scheduled for 3:12 p.m.